For us? It’s ice cream. When our family went gluten and dairy free a few years ago for our daughter, we more or less gave up ice cream. We’ve scratched the itch with banana ice cream fudgecicles (so good!) and the occasional pint of a coconut milk ice cream from the grocery store. But I have fond memories of making ice cream as a family growing up, and I didn’t want my kids to miss out on homemade, ice cream maker ice cream. This is an incredible (INCREDIBLE!) 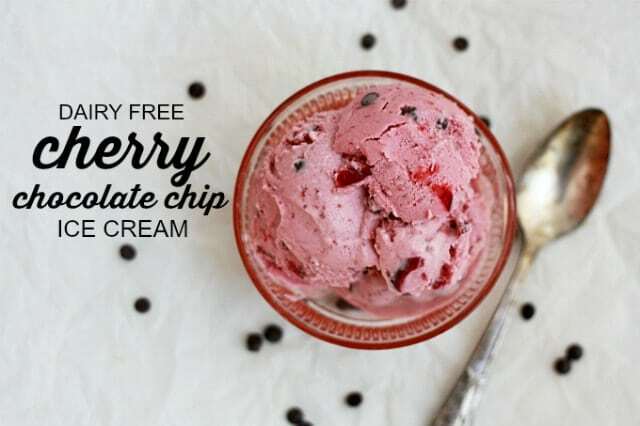 recipe for dairy free cherry chocolate chip ice cream. 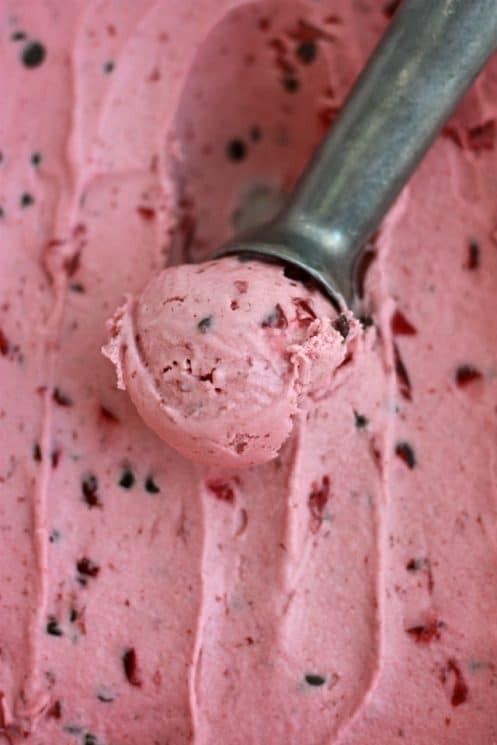 It’s got the rich, creamy feel of traditional dairy ice cream, without loads of extra sweeteners and lots and lots of fresh cherry flavor. The secret? The flavor and almost all the sweetness come from cherries. 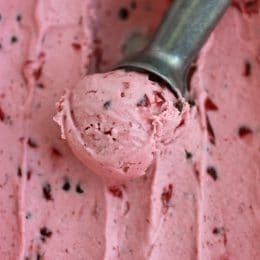 Whether you decide to scoop this onto cones, sandwich it between two cookies or graham crackers for an ice cream sandwich, or enjoy it straight from a little ice cream bowl, this ice cream lends the old-fashioned, homemade ice cream vibe you love without extra additives, dyes, or sweeteners. It’s actually not very far nutrition-wise from a coconut milk and cherry smoothie! P.S. The chocolate chips are purely optional, but I love the little crunch from a mini chocolate chip. You could certainly substitute carob chips or cocoa nibs in their place. One last note: One optional ingredient in the recipe you may not be familiar with is grass-fed beef gelatin. Gelatin contains proteins that can aid in digestion, gut health, joint health, and hair and nail growth. If you are vegan or avoiding beef products, you can substitute guar gum in its place. Neither is essential to the recipe, but using either gelatin or guar gum will give your ice cream an extra smooth, cohesive texture. Thanks to Spunky Coconut for this great tip! Emily lives, loves, and cooks at One Lovely Life, where you can find healthy meal ideas, book recommendations, and fun ideas for learning and playing with your little ones. Place coconut milk, almond (or other milk, if substituting. Other options are dairy, soy, hemp, or additional coconut milk), 1 1/2 cups of the cherries, maple syrup, vanilla, and almond extract in a blender. Puree until completely smooth. If using gelatin or guar gum, add this to the blender and pulse to combine. Refrigerate 1-2 hours or until completely chilled. Pour mixture into ice cream machine per manufacturer’s instructions. 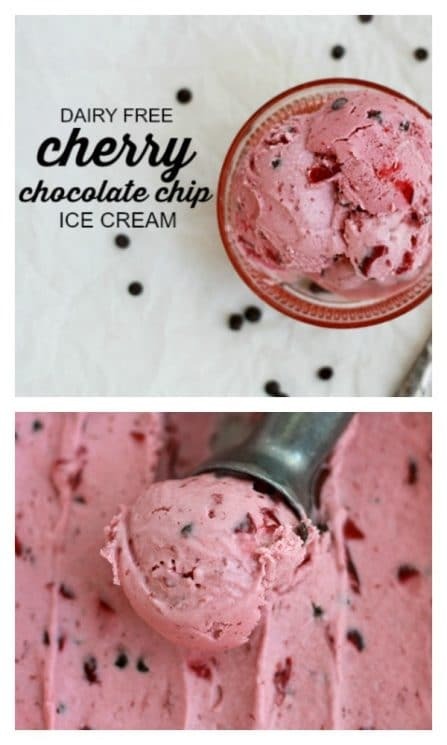 During the last 2-3 minutes of churning, add remaining 1/2 cup of cherries (finely diced) and the chocolate chips. Eat immediately as soft-serve, or pour into a shallow container, cover, and freeze 2-3 hours until firm. I’ve been wanting to make this for a few weeks now, you must have read my mind! 🙂 I’ll be adding this to my shopping list! 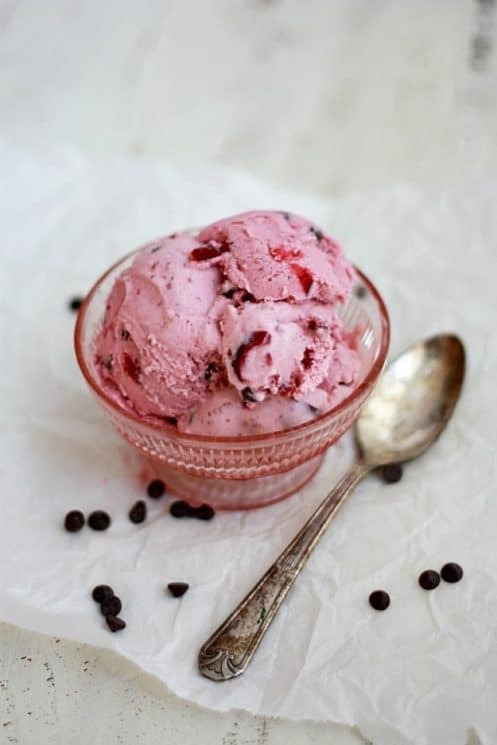 i love cherry chocolate chip ice cream! looks delicious. i’m going to make it soon! Hello, I found this recipe under the filter of nut free. I know and see the alternatives to almond milk, but what about the almond extract? Is this just for flavor or does it serve some material purpose to the recipe? Imitation almond extract would be OK- Pure almond extract should be avoided. You can also just leave it out. Thanks for the heads up! Hello! I am planning on making this tomorrow as part of a hostess gift and was wondering how much ice cream does the recipe make? Thank you!